Atheltic Step is a cardio workout that is part of Cathe’s Shock Cardio series. These workouts were created to compliment STS, which is her 3 month intense weight training program. I find this series a little odd. I found the section on Cathe’s website where she initially introduced this series. It explained that the idea was to “shock” your system with various different types of cardio: HIIT, MMA, Step and Circuit. The idea was to avoid “plateaus, overuse injuries and mental fatigue.” It complements STS because, as a strength program, STS creates “muscle confusion” and Shock Cardio mixes up your cardio workouts to improve both aerobic and anaerobic capacity. All of this is done with shorter cardio workouts (for Cathe, that is). Each workout is under an hour and some (HIITs) as short as 30 minutes. Having done this research, it does, sort of, make sense… except… in many ways, most of the Shock Cardio workouts deviate from what I have become accustomed to, Cathe-wise, that I don’t like them as much. (I LOVE Cardio Core Circuit—one of my favorites.) However, with that said, the Shock Cardio Series can be broken down into two categories—intense/advanced/anerobic and intermediate/aerobic. In the intense categorie: Cardio Core Circuit, HIITs and, to a lesser degree, Circuit Blast. In the intermediate/aerobic categorie: MMA Fusion, MMA Kickboxing and Athletic Step. There are more Shock Cardio workouts, but these are the only ones I own. I have a lot of mixed feelings about these workouts. First, they are Cathe workouts and I do enjoy every one of them. But secondly, I am an intensity junky—so if a workout isn’t up to my intensity standards, it just doesn’t get utilized as often. In fact, it usually gets designated as a “recovery” workout (if I like it enough) and I am really bad about doing recovery workouts as often as I should. That is where MMA Fusion, MMA Kickboxing and now Athletic Step are categorized for me—as recovery workouts. And I really, really like them! I really wanted them all to be more intense so I would do them more often. Alas, that is not the case. With that out of the way, let me actually review Athletic Step. Athletic Step is a 47 minute cardio step workout; 6 minute warm up, 33 minute training time and 8 minute cool down/stretch. Equipment: 6 inch step. The step choreography in this workout is very complex and not nearly as “athletic” as I expected it to be, considering the title. Nevertheless, I really liked it. Which is a big surprise—until recently I hated and avoided Cathe’s complex step choreography. 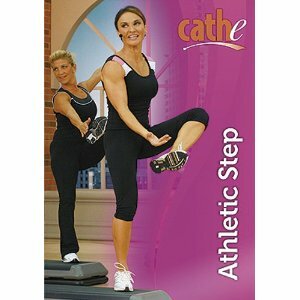 But I have come around and am now catching on to Cathe’s brand of step choreography. And I like it. A lot. Back to the review. I didn’t find Ahtletic Step to be terribly athletic. The warm up was very complex chorepgraphy with no opportunity to establish a learning curve whatsoever—the learning curve must already be in place (which for me, it now is). This is not a starter workout for Cathe choreography. She strings together a dozen different moves with no layering. She just expects you to know it. And now that I am doing a lot more Cathe step, I am familiar with all of the moves. But that doesn’t mean I didn’t get lost. I did. After some dynamic stretching you move into the step workout. It consists of 3 separate step combo routines. She does do some layering for the combos. So they are a bit easier to “learn” than the warm up—but the choreography is still rather complicated. Nevertheless, I thought the workout was fun and I really enjoyed it. After learning and repeating the each step combo, you run through each combo one more time. Well, not technically one more time, you do each complete combo twice on each side of the body. The workout portion of the workout ends with “athletic drills.” They weren’t real difficult or intense either. Some squats and lunges (all off the step) power 15s, moves like that. You get a brief cool down, then a long stretch. An obvious way to increase intensity of this workout is to raise the step height to 8 inches. And normally, I would do that. Except for the complex choreography. I fear I will trip and fall using a higher step. But I probably try it that way anyway. I really did like this workout and very much wanted it to be more intense. This workout contains no premixes.